Participants reported whether they ever or never experienced each OC feature in their lifetime. Class 1 included participants unaffected by OC features; class 2, those with OC features involving rituals and symmetry; class 3, those with OC features concerning germs and fear of illness; and class 4, those with severe OC features. American Psychiatric Association. Diagnostic and Statistical Manual of Mental Disorders.5th ed. Washington, DC: American Psychiatric Association; 2013. Robins L, Helzer J, Cottler L, Goldring E. NIMH Diagnostic Interview Schedule, Version III, Revised. St Louis, MO: Dept of Psychiatry, Washington University School of Medicine; 1988. American Psychiatric Association. Diagnostic and Statistical Manual of Mental Disorders.3rd ed, revised. Washington, DC: American Psychiatric Association; 1987. McCutcheon AL. Latent Class Analysis. Newbury Park, CA: SAGE Publications; 1987. Vermont JK, Magidson J. Latent Gold 4.0 User’s Guide. Belmont, MA: Statistical Innovations Inc; 2005. Littell R, Milliken G, Strout W, Wolfinger R. SAS System for Mixed Models. Cary, NC: SAS Institute Inc; 1996. Neale MC, Cardon LR. Methodology for Genetic Studies of Twins and Families. Dordrecht, the Netherlands: Kluwer; 1992. Importance Because of shared characteristics, pathological gambling (PG) has been variously conceptualized as an obsessive-compulsive (OC) spectrum disorder or as an addictive disorder. Prior community-based studies have not systematically determined the association between PG and OC features and whether common genetic factors contribute to both conditions. Objective To examine the association and genetic correlation between PG and OC features. Design, Setting, and Participants We performed a latent class analysis (LCA) of OC features, cross-sectional tests of association, and classic twin genetic analysis using results of telephone interviews conducted from March 2002 through November 2003. Participants included 1675 male twin pairs from the Vietnam Era Twin Registry, aged 45 to 60 years. Main Outcomes and Measures Ten OC features were queried and used to derive OC classes identified via LCA. Results The best-fitting LCA model identified the following 4 OC classes: unaffected (class 1), ritual/symmetry compulsions (class 2), germ/contamination obsessions (class 3), and severe OC (class 4). All PG symptoms were more common in class 4 OC and 6 of 10 PG symptoms were significantly more common in class 4 OC (P < .01). Participants in the severe class were most likely to have 4 or more DSM-IV or DSM-5 PG diagnostic criteria (odds ratio, 3.8 [95% CI, 1.8-8.2]). The genetic correlation between phenotypes was 0.44 (95% CI, 0.16-0.75). Conclusions and Relevance The association between OC features and diagnostic criteria for PG highlights a role of obsessions and compulsivity in PG, and the lifetime co-occurrence of these disorders results in part from common genetic variance. Phenotypic and genetic overlap between OC features and PG add to our understanding of the most appropriate classification of PG and offers insights for treatment development. Pathological gambling (PG) (gambling disorder in DSM-51) and obsessive-compulsive disorder (OCD) are each associated with elevated compulsivity,2-4 and some investigators have argued that PG might best be classified as an OC spectrum disorder.5 Others argue that similar biological features and treatment approaches indicate that PG is more like substance use disorders.6-9 Community data find elevated levels of comorbidity between PG and substance use disorders but not between PG and OCD.10,11 The relatively sparse data on the characteristics of OC behaviors among persons with and without PG may contribute to the continuing debate about the OC nature of PG. Because OCD has many distinct components experienced to varying degrees, comorbidity studies with PG would be informed by examining which components might be most strongly related to PG and not by limiting analyses to full OCD diagnoses. By testing for types of OC-related features (eg, rituals, symmetry, and hoarding) and their associations with PG, one may determine whether specific PG criteria are particularly linked to subtypes of OC features derived from latent class analysis (LCA). The utility of LCA to inform classification of psychiatric disorders has been demonstrated for nicotine withdrawal and dependence,12,13 which suggests expansion of the diagnostic criteria. 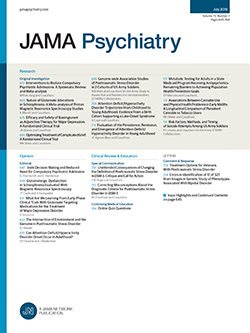 Distinct classes of withdrawal for other addictive substances (eg, alcohol) have been found that indicate significant associations with comorbidity and outcomes.14,15 By examining how classes of OC features are associated with PG, the classification of both disorders may be improved, comorbidity may be better understood, and treatment may be better informed. A key outcome of LCA is whether subtypes of disorders are defined by severity or by qualitative differences. An LCA of individuals with OCD identified 3 classes that differed mainly on severity.16 Although LCA has been applied to OCD, it has not been applied to OC features in the community, thus leaving unanswered questions about the structure of OC behaviors in the community and how OC features are associated with PG. We analyzed OC and PG features in a male-twin cohort. Given data on LCA of OC features in OCD,16 we hypothesized that we would identify OC classes differing predominantly in severity. Given data linking PG to dimensional constructs of compulsivity,2 we hypothesized that the identified classes of OC features would have varying associations with different PG diagnostic criteria and that OC classes of greater severity would associate with greater PG severity. To test the hypothesis that genetic factors would contribute to the co-occurrence of PG and OC classes, we estimated the genetic correlation and amount of genetic variance common and specific to PG and OC phenotypes. This study was approved by the institutional review boards of St Louis Veterans Affairs Medical Center and Washington University School of Medicine, as described previously.17,18 Participants provided verbal informed consent. In 2002, 1200 of the MZ and DZ twin pairs (2400 individuals) who were interviewed in 1992 were invited to participate in an additional computer-assisted telephone interview about PG. The 2002 interview also assessed OC behaviors. All twin pairs for whom at least 1 member of the pair endorsed 1 or more DSM-III-R criteria for PG in 1992 (456 pairs) plus a random sample of unaffected pairs (ie, no symptoms in both members of a pair; 744 pairs) were eligible. Of the 2400 eligible individuals, 252 were not contacted because they were deceased, not located, unavailable, on active military duty, or incapacitated. Of 2148 participants who could be reached by telephone, 1675 were interviewed from March 2002 through November 2003, yielding a 78.0% response rate. Respondents were aged 45 to 60 years in 2002. Trained interviewers contacted twins and began interviewing after obtaining verbal informed consent. Ten items were adapted from questionnaires used in the NIMH OCD Collaborative Genetics Study (https://www.nimhgenetics.org/interviews/study16_66/index.php) to capture cognitive and behavioral aspects of OCD. Respondents were asked if they had ever experienced any of the following: (1) rituals, that is, the need to do things in the same way (eg, bedtime rituals or washing and dressing rituals); (2) compulsions that involve cleaning household items or other inanimate objects; (3) repeated routine activities, such as going in and out of a doorway (eg, may not feel right unless you do these things a certain number of times); (4) ordering or arranging compulsions (eg, may waste hours arranging/ordering things and become upset if the order is disturbed); (5) hoarding (eg, having rooms filled with notebooks or wrappers; having a reluctance to discard things and a fear that they will be needed one day; picking up useless objects from the street/garbage); (6) violent/horrific mental images, such as murder or car accidents; (7) excessive concern with dirt or germs (eg, fear of getting germs from door handles or shaking hands); (8) lucky/unlucky numbers, worrying about numbers such as 13, having to start an activity at a lucky hour or to do things a lucky number of times; (9) a need for symmetry, altering things to make them symmetrical; and (10) fear of illness because of contamination or as a direct result of exposure to germs. Latent class analysis is a statistical method that can be used to investigate an observed association among a set of variables that may be continuous or categorical.31 The analysis is based on the assumption that the frequencies with which different symptom profiles occur can be explained by the existence of a small number of mutually exclusive classes, with each class having a distinctive profile of item endorsement probabilities (IEPs) that is constant for all members of that particular class. A critical implication of this assumption is that, under a mutually exclusive class solution, the conditional probabilities of endorsing a set of items are statistically independent within a given latent class. For a given latent class model, the parameter estimates are class membership probabilities and IEPs that reflect the likelihood that a symptom is endorsed by an individual, given membership in that class. Class membership in the present report is based on the probability of endorsing an OC feature under the best-fitting model. The Bayesian information criterion (BIC)32 was used to compare goodness of fit among complex models and to identify the most parsimonious model. The best-fitting model was selected by the smallest BIC value. We used the Latent Gold 4.0 program33 in LCA of the 10 OC features with the method of maximum likelihood. Interpretation of LCA results is not strictly an empirical exercise and requires judgment by researchers. To interpret our findings and describe the nature of the classes, we refer to some IEPs as high or low only in relation to other endorsement probabilities. In the present report, we consider an IEP of greater than 0.50 to be high and IEPs of greater than 0.80 to be very high. The arbitrary threshold helps to identify and characterize differences between classes. After derivation of a latent-class solution, we computed separate logistic regressions to obtain odds ratios (ORs) for the associations between each PG definition and the OC classes, with the unaffected class used as a common reference. We used the SURVEYLOGISTIC procedure34 to compute logistic models that account for the correlated nature of twin data by adjusting the SE. To determine whether associations between PG and OC subtypes could be explained in part by common genetic vulnerability, we fit bivariate twin models to PG and OC phenotypes. We fit a twin model to a PG phenotype defined as 5 or more PG criteria and an OC phenotype defined as the unaffected class vs all other OC classes. Separate models were fit for PG DSM-IV and DSM-5 criteria. Genetic and environmental contributions were decomposed into additive genetic, shared environmental, and unique environmental factors, with the last including measurement error. The bivariate model allowed for variance due to genetic and/or environmental factors specific to and common to the PG and OC phenotypes (see the eFigure in the Supplement). Models of maximum likelihood were fitted using MX software.35 Models were tested for goodness of fit against a saturated model that included no constraints on the correlation matrices that were estimated for MZ and DZ twin correlations. The most parsimonious model was selected as best fitting. Model fitting results and tetrachoric correlations are shown in eTables 1, 2, and 3 in the Supplement. The LCA indicated a 4-class solution best fit of the OC feature data as indicated by the lowest BIC value (BIC, 11 898) compared with the fit for 3-class (BIC, 11 957) and 5-class (BIC, 11 935) solutions. As shown in the Figure, class 1 contained 64.1% of participants; class 2, 20.8%; class 3, 7.9%; and class 4, 7.2%. Class 1 was characterized as unaffected owing to low IEPs for all OC features. Class 2 had high IEPs (range, 0.56-0.70) for OC features involving rituals and symmetry and was labeled as rituals/symmetry. Class 3 had high IEPs (range, 0.52-0.71) for OC features involving concerns about germs and fear of illness due to contamination and was labeled germs/fears. Class 4 had high (>0.50) and very high (>0.80) IEPs for most features and was labeled severe. The distribution of PG criteria and DSM-IV and DSM-5 PG within OC classes is shown in Table 1. We observed several systematic patterns of association between PG and OC classes. With the exception of inability to control or cut back, performing illegal acts to get money, impairing job/relationships, and borrowing money, the remaining PG criteria were significantly (P < .05) more prevalent in OC classes 2 through 4 than in OC class 1 (unaffected). The prevalence of each PG criterion in class 1 (unaffected) was low (range, 1.0%-7.0%). The prevalence of 6 to 10 PG criteria was highest in OC class 4 (severe). With the exception of preoccupation, the prevalence of PG criteria was similar in classes 2 (rituals/symmetry) and 3 (germs/fears). Having 1 or more lifetime PG criteria was most common in class 4 (33.3%), followed by classes 2 (23.9%) and 3 (19.1%), and significantly lower in class 1 (12.7%). Having 4 or more PG criteria summed according to DSM-IV and DSM-5 criteria was most common (9.9% for both) in class 4, similar in classes 2 (6.4% for both) and 3 (6.6% for both), and significantly lower in class 1 (3.5% for DSM-IV and 3.4% for DSM-5 criteria). The results of unadjusted logistic regression models of the association among PG criteria and DSM-IV and DSM-5 PG and OC classes are shown in Table 2. Compared with participants in class 1 (unaffected), participants in class 4 (severe), class 3 (germs/fears), and class 2 (rituals/symmetry) were all more likely to endorse escape gambling (OR range, 2.1-4.6), chasing (OR range, 1.9-4.1), and lying to others about gambling (OR range, 2.0-2.9). In addition to these significant associations, participants in class 4 were significantly more likely than those in class 1 to endorse preoccupation, spending increasing amounts of money, and inability to control or cut back (OR range, 2.5-3.1). Similarly, participants in class 2 were significantly more likely than those in class 1 to endorse preoccupation, spending increasing amounts of money, and impairing job/relationships (OR range, 2.0-2.7). Participants in class 3 were more likely than those in class 1 to endorse borrowing money (OR, 2.8). Compared with participants in class 1, those in classes 2 through 4 were significantly more likely to have 1 or more lifetime PG criteria. Participants in classes 2 and 4 were significantly more likely than those in class 1 to have 1 to 3 PG criteria (ORs, 2.2 and 3.3, respectively) as defined in DSM-IV and DSM-5, 4 or more PG criteria (ORs, 2.1 and 3.7, respectively) as defined in DSM-IV, and 4 or more PG criteria (2.2 and 3.8, respectively) as defined in DSM-5. The odds of having 1 to 3 criteria and 4 or more were greater in class 3 compared with class 1, but the difference was not statistically significant. The odds of having 5 or more PG criteria as defined in DSM-IV and 4 or more PG criteria as defined in DSM-5 were significantly greater in class 4 compared with class 1 for both classification systems (ORs, 4.1 and 3.1, respectively). The odds of DSM-IV and DSM-5 PG were greater in classes 3 and 2 compared with class 1, but were only significant for DSM-5 PG (OR range, 1.8-2.5). Tetrachoric correlations are reported in eTable 1 in the Supplement. Within-trait, cross-twin correlations for OC and PG phenotypes are larger in MZ than in DZ twin pairs, indicating genetic contributions to each phenotype. The cross-twin, cross-phenotype correlations are larger in the MZ than in DZ twin pairs, indicating that the association between OC and PG phenotypes includes a genetic contribution. The best-fitting bivariate twin model was determined by goodness of fit (eTables 2 and 3 in the Supplement). The best-fitting model included genetic and unique environmental contributions to PG and OC and correlated genetic factors. The model did not include family environmental contributions or correlated unique environment factors (eTable 1 in the Supplement). As shown in Table 3, parameter estimates for the best-fitting DSM-IV and OC model included a genetic correlation of 0.44 (95% CI, 0.16-0.75). As shown in Table 4, genetic factors accounted for 37.0% of the variance in liability to OC and 64.0% of the variance in liability for DSM-IV PG. Of the total genetic variance to OC, 7.2% overlapped with PG, 12.4% of the genetic variance in PG overlapped with OC, and 19.4% of the genetic variance was shared between PG and OC. As shown in eTables 4 and 5 in the Supplement, modeling DSM-5 PG and OC resulted in similar genetic correlations (0.42 [95% CI, 0.16-0.71]) and shared genetic variances (17.6%). We applied LCA to data from a population-based sample of middle-aged men from the VETR and identified distinct OC classes. The best-fitting LCA model allowed for 4 classes, including a largely unaffected class, a severe class characterized by high endorsement of most OC features, and 2 intermediate classes characterized by qualitatively distinct OC behaviors (rituals/symmetry and fears/germs). Largely consistent with our second hypothesis, the severe OC class (class 4) was more consistently and strongly associated with individual PG criteria and with greater PG severity. These findings complement those in the literature2 that have found individuals with PG to score higher than nonaffected comparison subjects on measures of compulsivity. They also extend findings by identifying common and specific patterns associated with the OC classes. For example, participants in OC class 2 (rituals/symmetry) were more likely to endorse preoccupation with gambling and spending increasing amounts of money compared with participants in class 3, who were more likely to endorse borrowing money. These findings suggest that underlying constructs (potential endophenotypes) might link OC tendencies to PG.3 Class 2 was characterized by OC features associated with rituals and symmetry that were qualitatively distinct from the contamination/germ fears in class 3. We speculate that the control and intentional behavior involved with rituals and symmetry may explain the stronger association with purposeful PG behaviors relating to the seeking of gambling and spending more money to gamble. These data raise the possibility that individuals with PG differing in OC features may benefit differentially from specific interventions targeting thoughts and behaviors, and this possibility warrants direct examination. We observed genetic factors accounting for 37.0% and 64.0% of the total variance in OC and PG, respectively. The genetic contribution to OC adds to the very few twin studies of OCD and is consistent with previous findings of twin analysis in adults that demonstrate a genetic variance of 27% to 47%.39 The 19.4% of genetic variance shared between DSM-IV and DSM-5 criteria for PG and OC supports our hypothesis that common genetic variance contributes to the OC-PG association. Unique environmental factors did not overlap, which suggests that environmental cues for gambling, such as casino advertising, would have little effect on the expression of OC features. Because all participants were male, predominately white, and purposefully enriched for 1 or more PG criteria, the present results may not generalize to women or to racial minority groups. Our survey did not include OCD measures (ie, the Yale-Brown Obsessive Compulsive Scale) used in prior LCA studies16 and did not diagnose OCD, and the present findings may not generalize to cohorts selected for OCD. The cross-sectional nature of the study precludes precise identification of the natural history of OC features. Data were collected without prior knowledge of the respondents’ OC status. The use of computer-assisted telephone interviews and structured clinical instruments likely reduced potential interviewer bias. The sample does not have the bias inherent in more severely affected clinical populations. The large sample size permitted derivation of multiple classes of OC features, allowing statistical comparisons with individual PG criteria and across multiple levels of PG severity. Severity and type of OC classes exist in middle-aged men and are associated with individual PG criteria and PG severity, with increasing severity of OC associated with increasing severity of PG. The co-occurrence of OC and PG partly results from common genetic influences. This finding may inform disorder classification and treatments targeting common features of OC and PG. Submitted for Publication: May 28, 2014; final revision received July 24, 2014; accepted September 13, 2014. Corresponding Author: Jeffrey F. Scherrer, PhD, Department of Family and Community Medicine, St Louis University School of Medicine, 1402 S Grand Blvd, St Louis, MO 63104 (scherrjf@slu.edu). Published Online: February 11, 2015. doi:10.1001/jamapsychiatry.2014.2497. Author Contributions: Dr Xian had full access to all of the data in the study and takes responsibility for the integrity of the data and the accuracy of the data analysis. Drafting of the manuscript: Scherrer, Xian, Eisen, Potenza. Administrative, technical, or material support: Scherrer, Xian, Eisen, Potenza. Study supervision: Scherrer, Xian, Eisen, Potenza. Conflict of Interest Disclosures: Dr Scherrer has received research support from the National Institutes of Health (NIH) and the Office of Research and Development of the Department of Veterans Affairs (VA), has performed grant reviews for the Office of Research and Development of the VA and the NIH and other agencies, and has given academic lectures in grand rounds, continuing medical education (CME) events, and other clinical or scientific venues. Dr Xian has received research support from the NIH, Office of Research and Development of the VA, and St Louis VA Clinical Epidemiology Center. Dr Potenza has consulted for and advised Boehringer Ingelheim, Lundbeck, Ironwood, and Shire; has consulted for Somaxon; has received research support from the NIH, the VA, Mohegan Sun Casino, the National Center for Responsible Gaming, Forest Laboratories, Ortho-McNeil, Oy-Control/Biotie, GlaxoSmithKline, and Psyadon Pharmaceuticals; has participated in surveys, mailings, or telephone consultations related to drug addiction, impulse control disorders, or other health topics; has consulted for gambling entities, law offices, and the federal public defender’s office in issues related to impulse control disorders; provides clinical care in the Connecticut Department of Mental Health and Addiction Services Problem Gambling Services Program; has performed grant reviews for the NIH and other agencies; has guest-edited journal sections; has given academic lectures in grand rounds, CME events, and other clinical or scientific venues; and has generated books or book chapters for publishers of mental health texts. No other disclosures were reported. Funding/Support: This study was supported by grant MH60426 (Pathological Gambling: Courses, Consequences and Causes) from the Health Services Research and Development Service of the VA and National Institute of Mental Health and by a Yale Center of Excellence in Gambling Research grant from the National Center for Responsible Gaming. The US VA has provided financial support for the development and maintenance of the VETR. Additional Contributions: The US Department of Defense, National Personnel Records Center, National Archives and Records Administration, Internal Revenue Service, National Opinion Research Center, National Research Council, National Academy of Sciences, and Institute for Survey Research provided invaluable assistance in the conduct of this study. Most important, the members of the VETR and their families provided continued cooperation and participation, without which this research would not have been possible.